Buy Aberdeen rowies online, butteries, Aberdeen rolls, butteries, buttries by post, mail order online from The Scottish Store. We feel that this iconic Scottish product is worthy of its own website for many reasons and even more so now that the word rowie has made it into the official Oxford dictionary. For those who do not know what an Aberdeen rowie is - well you have never lived! The Aberdeen rowie is often referred to as a buttery or just an Aberdeen roll. They are delicious and can be eaten hot, cold and often toasted, either way they are totally scrumptious. The beauty of this product is that it can be shipped worldwide due to it's ingredients as the rowie was orginally made for fisherman going out to sea for days at a time when ordinary bread or rolls went stale the good old rowie stayed edible. We can send our rowies to every corner of the globe, it can be pricy but we often send them to customers in Australia and New Zealand who are just desperate to get a hold of a rowie. Shipping costs are based on the weight of your order and the quantity you purchase. Buy our delicious Aberdeen rowies online now! 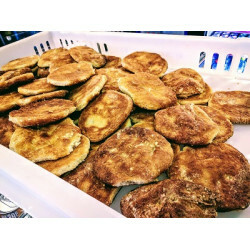 Delicious traditional Aberdeen rowies made by award winning bakers Thains in Aberdeen.Aberdeen Rowie.. Delicious traditional Aberdeen rowies made by award winning bakers Thains in Aberdeen.12x packs of 4.. Delicious traditional Aberdeen rowies made by award winning bakers Thains in Aberdeen.6 x packs of 4.. Copyright © 2018, Buy Aberdeen Butteries Online, All Rights Reserved.